I finally got the chance to work on my images from this past Autumn. I have posted a few of them in the photo album to the right called Autumn 2007. These images were all taken in California's Sierra Nevada - mostly on the eastern side but the shot of the little Truckee River was taken in the northern Sierra. All these images are available as fine art prints from 16x20 size up to 44x60. I am delivering a new print to a client tomorrow that is 44x60 with a digital matt mounted on gator board and framed (no glass). I gave it about 10 coats of premier art print shield, so it is pretty bomber on the surface. I will try to take an installation photo and post it on the blog tomorrow. In other news, the Livebooks designers have completed a mock up my new website, and I am very pleased with the new design they have created. I hope to be able to launch the site in the next week, it is a fairly labor intensive process for me to upload all new image portfolios since the jpegs on my existing site are much smaller and the new site will allow for larger ones. I now have to redo my entire image portfolio into 920x562 pixel jpegs to accommodate the larger display size - thank heavens for photoshop batch processing. 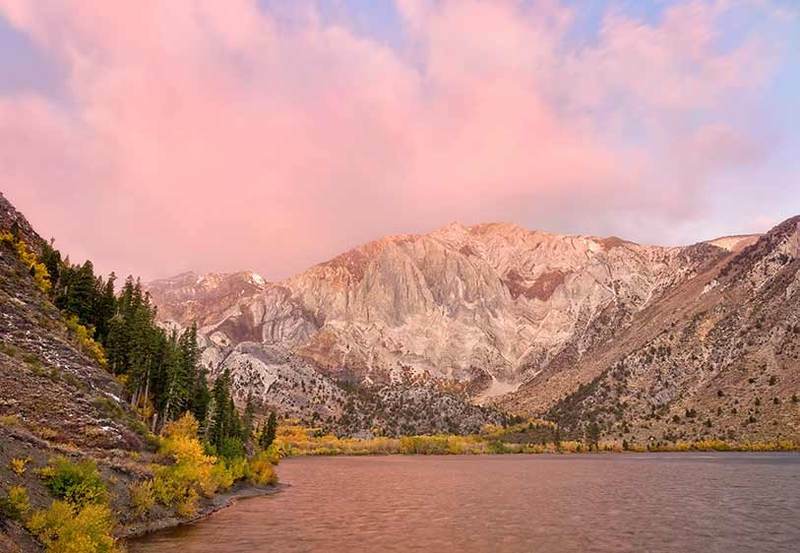 The image below was taken on a windy sunrise morning at Convict Lake in the eastern Sierra.